The satirical weekly Charlie Hebdo grossed a record €8 million in sales, which combined with subscriptions, donations, and public support earned the magazine a total of €10 million. Five million copies hit newsstands in 16 different languages on Wednesday, each selling for €3. The magazine grossed €8 million in sales. In the wake of the attack, Charlie Hebdo's printer and distributor offered their services, which added additional profit to windfall sales. In December the magazine was struggling to make ends meet and only had a weekly circulation of about 28,000, and had made a public call for donations. More than 40 percent of the publication's revenue is sourced from subscriptions, which skyrocketed from 7,000 to 120,000, according to one of its columnists Patrick Pelloux. 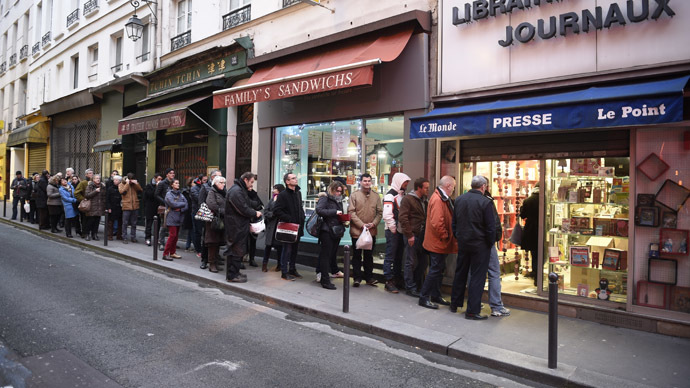 Copies of the satirical weekly sold out within an hour across Paris. It was the first issue published since the editorial offices were attacked in a shooting a week ago in which 12 people were killed, including 9 members of the magazine’s staff. Another journalist visiting from another publication was also killed along with two police officers. All proceeds from the sale of this week’s edition will go directly to Charlie Hebdo and the families of the victims. The front page of Charlie Hebdo's Jan. 14 edition shows a cartoon of a tearful Mohammad holding a "Je suis Charlie" (I am Charlie) sign below the headline: "Tout est pardonné" (All is forgiven). It’s the work of cartoonist Renald 'Luz' Luzier, who wasn’t present when the office was attacked. On Sunday, nearly 4 million people were out on the streets of Paris to show solidarity with the victims, which also included police officers, and four Jewish people who the next day were held hostage and killed at a kosher deli. The march for unity was attended by over 40 world leaders. Charlie Hebdo has raised €250,000 through the Digital Press Fund, set up by Google to support the magazine. France’s Culture Minister Fleur Pellerin has pledges to support the magazine with €1 million in state funds. Amazon and eBay sites have also committed to pass on any profit from ‘Je suis Charlie’ products to the publication.